Lynn Cross awaits a Fringe show. The 10-day Minnesota Fringe Festival is well into its first week. Some people like to immerse themselves in the Fringe, and sample every theatrical flavor it offers. One such Fringe aficionado took MPR on a tour. Minneapolis, Minn. — You could feel the anticipation as a line of Fringe goers queued up outside the Red Eye Theater in Minneapolis. They were waiting to see "The Queen of Block E," starring Heidi Arneson. Lynn Cross is in the crowd. She's there mainly to see what her friend, Arneson, has come up with. With the Fringe, the odds are sometimes worse than a coin flip that the show will be great, but Cross says "Queen of Block E" is a sure bet. "You know this one's like shooting fish in barrel," she says. "I know it will be good." "The Queen of Block E" is Arneson's forecast for American liberties and freedom. She plays a homeless super hero, leading a band of street people in a society that's squelching individual rights. Afterward, when Cross is asked if she liked the piece, she says she's not sure if 'like' is the right word to describe her response to Arneson's brand of theater. "It's almost like surfing in a way," she says. "It's like surfing the collective unconscious. That's how she does it. You just have to let her take you on the ride." With her bobbed hair, glasses and slightly bashful demeanor, Cross may not fit the stereotype of a Fringe fanatic. But behind her seemingly reserved facade burns the heart of a thespian. 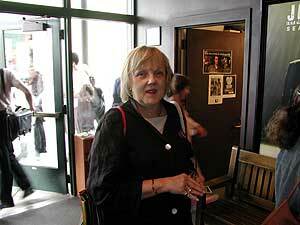 Cross is one of the co-founders of the Minneapolis community theater group, the Whittier Community Play. She performs every three months or so as part of the all women Wild Yam Cabaret in St. Paul. Cross has been a Fringe devotee since its inception more than ten years ago, averaging at least ten shows a year. Today's Fringe, she says, is nothing like the Fringe of yesteryear. "It was very poorly organized and just fly-by-night and nobody knew what was going on and things got dropped and cues were missed and it was just a really rag tag affair," she says. "And each year it just kept getting better and better." Our next stop on Cross's tour of the Fringe happens a couple nights later at the Jungle Theater in Minneapolis. It's Amy Salloway's one woman show, "Does This Monologue Make Me Look Fat?" The subjects of obesity and body image sound promising to Cross, plus she says the show is a repeat from last year and it generated a buzz. "So I know it's one of those 'don't miss shows' and I always try to see at least one of those," she says. Salloway's monologue includes her adventures at a women's conference on body image attended almost exclusively by lesbians. She also recalls her childhood struggles with her mother over her dreams of becoming an actress. Salloway's piece turns out to be a poetic and poignant portrait of an extremely overweight woman. It's also really funny. Cross says many Fringe shows don't live up to their billing, but this one, thanks to Salloway's talent, does. "Oh, I thought she was great," she says. "She's a wonderful writer. She has a very good ear, and a good storyteller." Our final Fringe event of the evening is a few blocks away in a church basement/block box theater. It's called "Alien Potluck," the latest production from the Corcoran Park Players. If there's been word of mouth on the show, Cross hasn't heard it. "It could be painful or it could be wonderful," she says. "It could go either way. It could be a little bit of both of those things. I think this is probably essence of fringe if I'm not mistaken." "Alien Potluck" ends up being a series of rather silly, often bawdy, comedy sketches about everything from elevator etiquette to a send up of Richard Simmons. The Alien Potluck skit is about four Lutheran women who use their cooking to subdue other alien life forms and take over the universe. The actors are obviously having a great time and the audience is eating it up, which prompts this observation from Cross. "I always wondered what would happen if Lutherans ran amuck in their church basements and now I know," she says. For Cross, "Alien Potluck" is vintage Fringe. The creeping professionalism that's beginning to infiltrate the festival worries her. Cross believes the Fringe is about originality and supporting developing performers. She says as long as it does that, it's staying true to its mission. "But when it's just kind of an extra venue for somebody that's already pretty well established, and or is just there to make money....I see that happening," she says. "And I don't think that's part of the Fringe." Only a theater hotbed like Minneapolis could support something like the Minnesota Fringe Festival. But Cross says the theater scene and the Fringe feed each other. She's seen a lot of theater around the country. She says if Minneapolis can compete with New York and Chicago in terms of theater, the Fringe is a big reason why.